"The New Orleans Saints took their winning streak to eight games by thrashing the Cincinnati Bengals 51-14 as Drew Brees threw three touchdown passesin the first half to move to 509 for his career as he chases Peyton Manning's NFL-record of 539." The Los Angeles Rams bounced back from their first loss of the season with a 36-31 victory over the Seattle Seahawks on Sunday as receiver Brandin Cooks ran in from nine yards out for what proved to be the game-winning score with six minutes remaining after Dante Fowler Jr forced and recovered a fumble from Russell Wilson. Rams quarterback Jared Goff passed for 318 yards and two touchdowns, and Todd Gurley rushed for 120 yards and scored a touchdown for the 13th consecutive game while the Seahawks did most of their damage on the ground, with rookie Rashaad Penny rushing for 108 yards and a touchdown in the absence of the injured Chris Carson - rushing 273 yards in total. However, despite a late Seattle rally, the Rams held on for the win and move to 8-1 on the season. The Seahawks, meanwhile, lose further ground in the NFC West at 4-5. The New Orleans Saints took their winning streak to eight games by thrashing the Cincinnati Bengals 51-14 as Drew Brees threw three touchdown passes in the first half to move to 509 for his career as he chases Peyton Manning's NFL-record of 539. Michael Thomas was on the end of two Brees TD throws, while running backs Mark Ingram and Alvin Kamara grabbed two scores each as the Saints racked up 244 rushing yards in a win which takes the third favourites for the Super Bowl to 8-1, while the Bengals (5-4) have lost three of their last four. 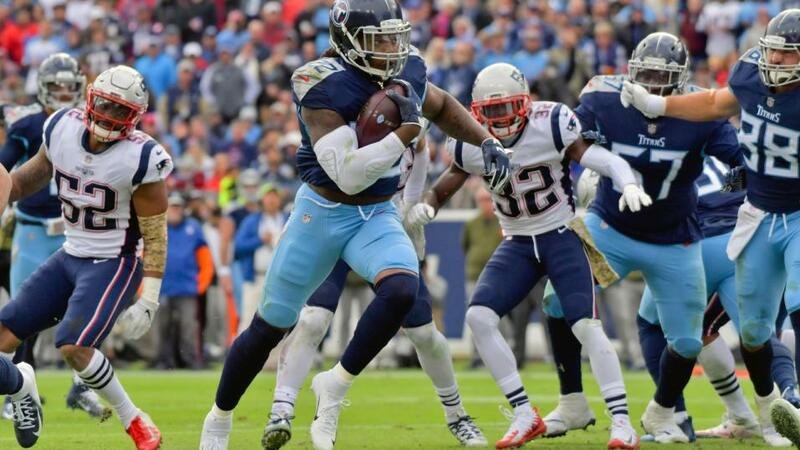 Sunday also saw the Tennessee Titans stun AFC East leaders New England 34-10 and are now well-placed in the AFC play-off race after the Miami Dolphins suffered a 31-12 loss to the Green Bay Packers while another surprise came in the form of the Dallas Cowboys' 27-20 win over the Philadelphia Eagles. The Chicago Bears, who hadn't defeated a fellow NFC North team since October 2016, snapped that streak as QB Mitch Trubisky led his team to a 34-22 win over the Detroit Lions and Matt Barkley sparked Buffalo's misfiring offence with two touchdown passes as the Bills embarrassed the New York Jets 41-10. Patrick Mahomes threw his 31st touchdown pass of the season to set a new team record as the Kansas City Chiefs eased past the Arizona Cardinals 26-14 to go to 9-1 and Andrew Luck threw three touchdown passes in the first half to ensure a 29-26 victory over the Jacksonville Jaguars while four turnovers contributed to the Tampa Bay Buccaneers' 16-3 loss to the Washington Redskins. The Los Angeles Chargers have now won six games on the spin after a comfortable 20-6 victory against the Oakland Raiders and now find themselves in second place in the AFC West. Meanwhile, in Cleveland, rookie Baker Mayfield threw a season-high three touchdown passes and Nick Chubb ran 92 yards for a TD as the Browns ended a four-game losing streak with a 28-16 win over the Atlanta Falcons. The Utah Jazz survived a fourth-quarter rally to defeat the Boston Celtics 123-115 on Friday night to improve their record to 6-6 while the Orlando Magic prevailed at home over the Washington Wizards 117-108 in a matchup which saw the worst offence in the league come up against the worst defence. Also on Friday Andre Drummond had 23 points and 11 rebounds as he took the Detroit Pistons to a 124-109 victory over the Atlanta Hawks and Joel Embiid had a season-high 42 points to go along with 18 rebounds and four blocked shots as the Philadelphia 76ers defeated the Charlotte Hornets 133-132 and there were also wins for Indiana, Brooklyn and Sacramento. LeBron James scored a game-high 25 points to lead the Los Angeles Lakers to a 101-86 win against the Sacramento Kings on Saturday night while, also in California Quinn Cook, deputising for the injured Stephen Curry, scored 19 of his 27 points in the first half, helping favourites for the NBA Western Conference the Golden State Warriors, to a 116-100 victory over the Brooklyn Nets. Also on Saturday John Wall scored 28 points and Jeff Green added 19 and 10 rebounds as the Washington Wizards defeated the Miami Heat 116-110 in Florida and Zach LaVine scored 24 points and Wendell Carter Jr. added 15 as the Chicago Bulls defeated the Cleveland Cavaliers while there were also wins for the Dallas Mavericks, San Antonio Spurs, Philadelphia 76ers and New Orleans Pelicans.